Dunbeacon Pottery | How is pottery made? 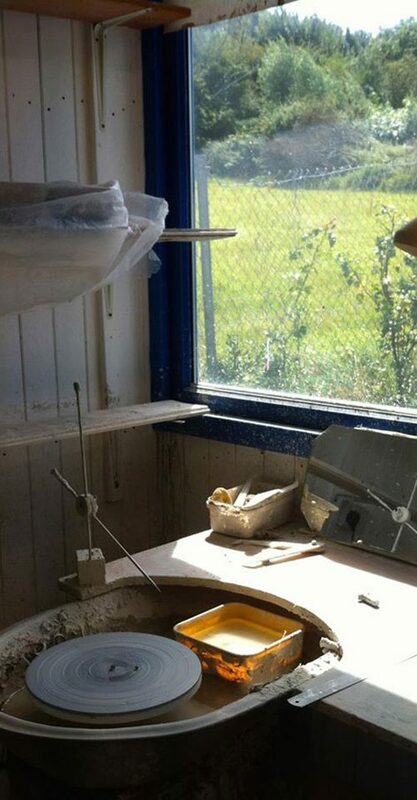 Each piece of pottery is hand made by Helen. There are a number of stages in the making of a piece of pottery. 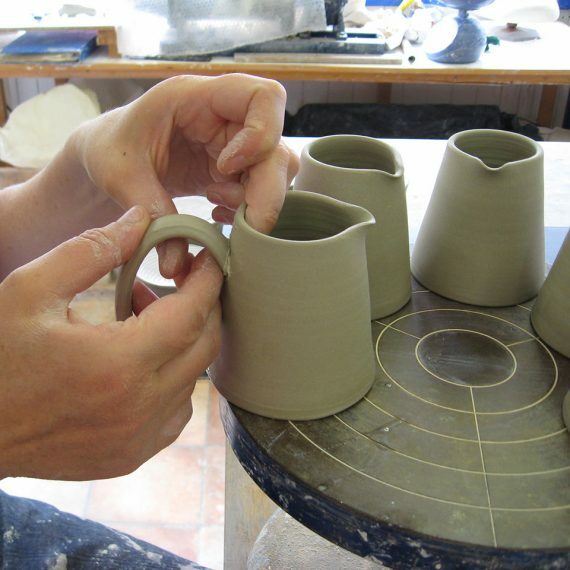 It starts with a bag of clay and finishes with a mug, jug or bowl. Helen uses stoneware clay which comes from Cornwall in England. There are no large deposits of stoneware in Ireland so it is not possible to use Irish clay. She chooses to use stoneware because of its strength and durability. The clay comes via Cork in 25kg bags, this is mixed with recycled clay (mostly shavings from the later ‘turning’ stage) in a fresh to recycled 75:25 ratio. This mix gives a good strong consistency for throwing. The clay is next put through the ‘pug machine’ which squeezes the air out and compresses the clay into long tubes. These are then stored in plastic until ready to use. There’s usually about 66 kg of clay processed at a time. Helen generally works in batches of 20-30 items depending on what she is making. What she makes each day depends on what is on order and on what is needed in the showroom. She starts with weighing out balls of clay to a specific size. A large mug for example needs a 1lb ball of clay to start. 20 balls of clay are measured and stacked beside the wheel along with 20 circular boards as each item will be thrown onto it’s own board. Now the throwing can begin. Though this is the most skilled part it often feels like the quickest part of the process. 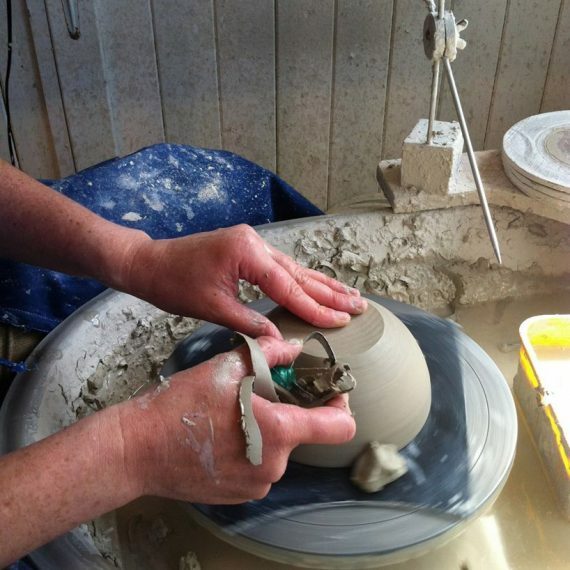 The clay needs to be ‘centred’ on the wheel, and the pot shaped. Helen uses a tool to gage height and width in order to produce ware that is as consistent as possible. If she is making jugs she will shape the spouts at this stage. A fine wire is run underneath the pot to separate it from the round base board, the boards are then put onto a shelf beside her, and the next piece made. These shelves full of wet pots are next placed on the drying rack and left for a day or two to get ‘leather’ hard. The pots can then be ‘turned’. They are put upside down on the wheel and the bases trimmed to a smooth finish. Depending on the item they may get further shaping, plates for instance or the butter dish which gets it’s top handle put on at this stage. Handles will have been made before the turning for mugs and jugs etc. Helen uses the traditional method of ‘pulling’ handles as this gives the strongest handle. From a large lump of clay the handle is ‘pulled’ out to the right length and size. These are laid out to be ready for attaching to the vessel. Both jug/mug and handle have to be at the right stage when being put together, too wet and the pressure will push the whole piece out of shape, too dry and they won’t attach properly and cracks will appear later on. Pots then go back on the drying rack to dry completely before their first firing. This could be another 2 to 6 days depending on the temperature of the workshop. The first firing is called the bisque firing and goes up to 1,000 degrees celcius (1,832 farenheit). Pots can be stacked, within reason, on top of each other for this firing. It’s vital that everything is completely dry as moisture inside a pot if heated too quickly will expand and can cause the pot to basically explode, destroying itself and others near it. 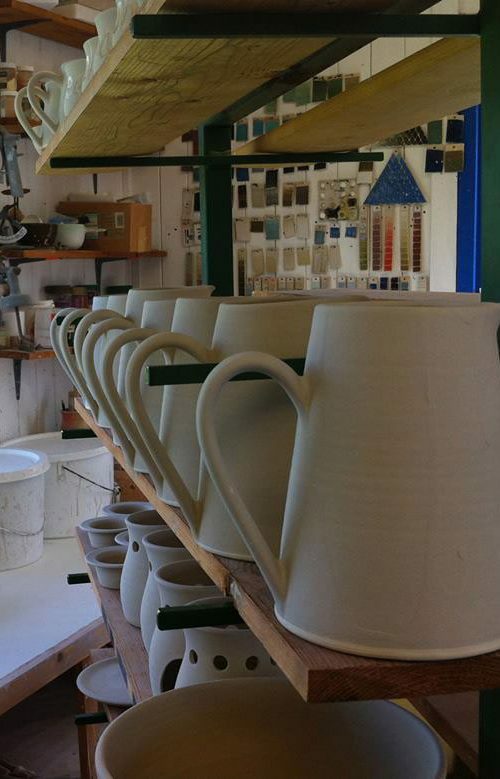 The Bisque kiln can be opened by late morning the next day (our kilns are always fired overnight). The pots are now hard ceramic but very porous. They can be prepared for glazing straight away. In the Glaze kiln it’s important that the pots do not touch each other so Helen plans the space carefully to fit as much as possible into the kiln. Selected pots are then lightly sanded and rubbed down to ensure no grit or dust is present. Everything is laid on shelves on the trolley and taken for ‘waxing’. Wax is applied to the underside, usually just the rims but sometimes the whole base, of each pot. Wax is also used to write words or names on some of the items, eg. the ‘Utensils’ pot. The wax acts as a ‘resist’ so that in the firing the glaze does not run down to the base of the pot as it would completely fuse to the kiln shelf if it did, ruining the pot and the shelf. With a tongs, each item is dipped into a bucket of glaze for a calculated number of seconds. Bases are wiped clear of glaze and the pot is put back on the trolley. Helen mixes the glazes at the workshop using recipes composed of various minerals and oxides. The recipes she uses are traditional ones which she has adapted. The pot soaks up the water in the glaze leaving the glaze powder on the surface. 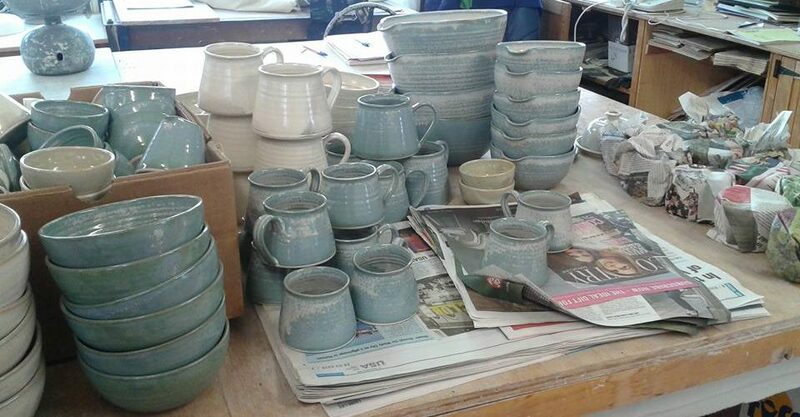 The pots now need to dry overnight before being placed in the kiln. This second firing goes up to 1,260 degrees celcius (2,300 farenheit). Helen uses electric kilns with a controlled temperature firing: the temperature rises at a set rate, is held at the top temperature for a period of time at which stage the glaze will melt. This firing happens overnight and takes a further 2 days before the kiln can be opened. The pots are taken out, and each one checked to make sure meet Helen’s standard, they are then priced and put on the showroom shelf or packed for orders.